If you’ve always wanted to try mountain biking, but don’t know where to start, we’re here to help! Before you can zip through exciting Smoky Mountain trails, there are just a few basic things to remember that will lay a solid foundation for progress. Once you’ve mastered the fundamentals, you can move on to learn about and try more complex techniques, which will make you a more skilled rider. Here are 5 tips for mountain biking in Gatlinburg that will help you along the way. If you’re ready to go a little out of your comfort zone and have an amazing mountain biking experience, then CLIMB Works is the perfect place to go! Our trail is considered to be intermediate, but don’t worry! Our bike experts will be there the whole time to give you pointers and to ensure that you have a great time. 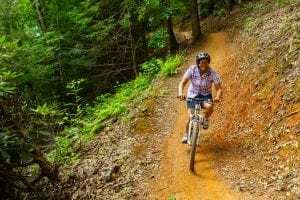 When you go mountain biking in Gatlinburg, you’ll want to be sure to wear clothing made of breathable and durable fabrics like nylon or spandex. Be sure to dress accordingly for the weather. If it’s colder outside, you might want to add a few more layers to your outfit. However, it really just depends on what the climate is like where you live and what will make you the most comfortable during your ride. Some common items that mountain bikers prefer to wear are lightweight and waterproof jerseys, padded shorts, mountain biking gloves, knee pads, and of course, a helmet. Riding uphill can be challenging if you don’t have your bike set to the right gear. Do yourself a favor and shift your bike into a lower gear so that you can pedal up hills with ease. When you’re traveling downhill, do the exact opposite and shift your bike into a higher gear to avoid speeding forward. Using the brakes on a mountain bike effectively can result in you being much more in control of your ride. This doesn’t necessarily mean clutching onto them abruptly to come to a stop, but lightly squeezing them from time to time to moderate your speed. When you’re first starting to mountain bike, just take it slow so that you can get a feel for the brakes and what speeds you’re comfortable with. There are both front and back brakes on a mountain bike, and you can practice shifting your weight when you brake as you get more experienced. This will make braking more effective, especially as you learn to ride on rougher terrains. One of the best ways to learn about mountain biking is to watch more experienced riders. Take mental notes on their technique, what they’re wearing, everything. There is always something new to discover and you can improve a great deal if you look at those who know what they’re doing. These are just a few helpful tips to get you started, and there are so many more exciting things to learn! For a fun experience that will teach you even more about this awesome sport, be sure to give our mountain biking in Gatlinburg a try!